The number above this fashionable foe gets smaller with every Medal you use. Once it reaches 0, watch out! Prepare to dispel status ailments whenever possible! 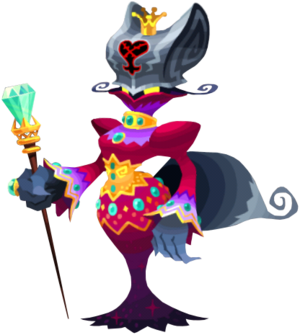 The Mean Maiden is an Emblem Heartless introduced in Kingdom Hearts Union χ. It is the final boss in Castle of Dreams. The Mean Maiden is a Heartless summoned by the darkness inside Lady Tremaine's heart. When Player and Jaq are about to free Cinderella from her bedroom, they hear her screaming. As they enter the room, the Mean Maiden is about to attack the young woman. Player defends Cinderella, and destroys the Heartless. This page was last edited on 18 April 2019, at 21:42.